[https://images]Don’t fall for fake news, click here to check out The Quint’sWebQoof stories. “दुबई में मुस्लिम ओरतो ने नई पहल करते हुए मस्ज़िद में राम भजन प्रस्तुत किया, विडियो शेयर किजिये और 125 करोड लोगो तक पहुचाये..."
The video has been widely shared on Youtube, and several other social media platforms. The video has been viral on social media for at least two years. While the participants in the video are certainly Muslim and are most definitely singing Ram bhajans, it is not inside a mosque, as claimed by the message. The video is in fact from Sathya Sai Baba’s ashram in Puttaparthi — Prashanti Nilayam. SO WHO ARE THE WOMEN IN THE VIDEO? The original video, shared by Radio Sai, dates back to 10 July 2012, and the singers are from Region 94 of the Sri Sathya Sai International Organisation (Bahrain, Iran, Kuwait, Oman, Qatar, Saudi Arabia, Syria, Turkey and United Arab Emirates). The viral video has been edited from the original video and can be traced back to 44:00 minutes in the former. Clarifying the video over an email interaction with The Quint, the Sathya Sai Baba International Organisation said that while not all the participants seen in the video are Muslims or Arabs, some of them most definitely are. The clarification added that such events were often held in Prashanti Nilyayam to signify unity of religions, which was one of Sathya Sai Baba’s primary message to his devotees. 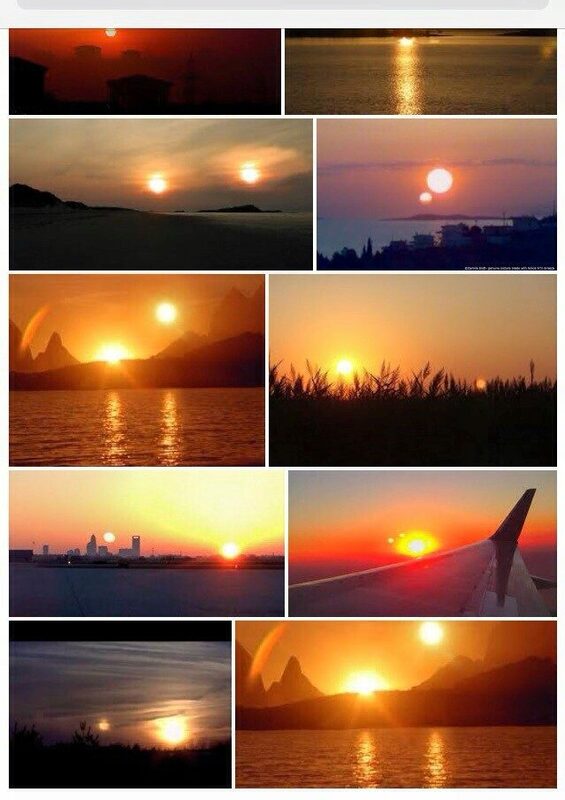 Photographs depict a rare "Hunter's Moon," a phenomenon that creates the appearance of two suns in the sky. Hunter’s Moon is just a name. It’s the name for the full moon after the Harvest Moon, which is the full moon nearest the autumnal equinox. In the Northern Hemisphere, the Harvest Moon sometimes falls in September and sometimes falls in October. So the Hunter’s Moon sometimes falls in October and sometimes in November. Hunter’s Moon is just an ordinary full moon with a special path across our sky. Most Hunter’s Moons aren’t really bigger or brighter. They’re definitely no more colorful than any other full moon. Still, many of us do think the Hunter’s Moon always looks bigger … or brighter … and more orange than usual. The first full moon after the autumnal equinox (known as the Hunter’s Moon) occurred on 26 and 27 October in 2015 and not 3 November 2015, as the Facebook post suggested. As for the appended photographs, two of them were unrelated to the full moon of 26-27 October 2015. 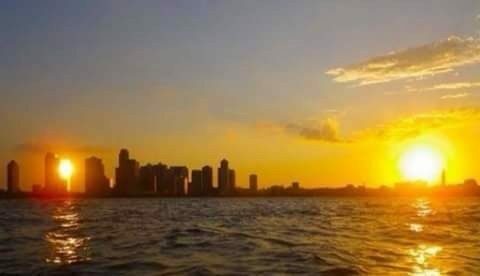 Pictures of a strange phenomenon broadcast in Canada illustrate the emergence of a Shamseen sky in Canada, England, China, and Russia. An astronomer said that this phenomenon is very normal and is a result of a convergence with Jupiter and the reflection of sunlight back to Earth. This phenomenon occurs every 139 years. The claim preceding the “two suns” rumor attributed the purported phenomenon to the visibility of Jupiter, and maintained that it occurred approximately once every century and a half (but in fact, Hunter’s Moons occur annually). Social networking picked up an image taken at sunrise on Sunday in the Moroccan city of Tangier. Scientists stressed that it is a natural phenomenon that appears at sunrise and results from ice crystals accumulating in the atmosphere, with sunlight reflecting on those “crystal pools” and creating what seems like a second sun. While the first full moon after the autumnal equinox is called a Hunter’s Moon, that designation is simply a name which has no relationship to an illusion of duplicate suns in the sky. Images circulating on social media along with the rumor were published before the late October 2015 Hunter’s Moon and thus weren’t depictions of that event. FACT CHECK: Are These Photographs of a 'Hunter's Moon'? क्या है वायरल तस्वीर में? क्या है वायरल तस्वीर की सच्चाई? इस सन्देश को सभी जगह फैला दे ताकि सभी 130 करोड़ भारतीयो को  अपने कर्तव्यों का पता चल जाये। सभी ग्रुप और पर्सनल no. पर भी भेजें।     we are with India and Indian Army and Start from today are you with us. Earlier sources from Security Forces denied. New Delhi: Nowadays, a number of WhatsApp users are getting a message about Indian Army Welfare Fund. The message has gone massively viral as it talks Narendra Modi government's initiative about how a common man can donate money for purchasing weapons for the Indian Army and providing facilities for war casualties. "Pay only Rs 1 per day (Rupee one only). Like never before, the Modi government has started a new scheme exclusively for the Indian Army Battle Casualties and Weapon Purchase. The government has opened a bank account where people can donate funds directly to the Army Welfare Account which will be used for purchasing weapons for the Indian Army and providing facilities for war casualties. People had suggested to the government to open a bank account to collect funds exclusively for battle casualties and purchasing weapons for the army, the Modi government has accepted the suggestion and opened an account in Syndicate Bank, New Delhi for the same. The most attractive feature of this scheme is that people can donate the smallest amount of ONE RUPEE. This is a Master Stroke by the Modi government. Our country’s population is 130 crore, even if 100 crore people (70%) deposit One Rupee Each, the ministry will get Rs 100 Crore/day, Rs 3000 Crore/month and Rs 36000 Crore/year. Rs 36,000 Crore is greater than Pakistan’s total defence expenditure. We spend hundreds and thousands of rupees on many unnecessary things, if we can spend ONE RUPEE for the Army, it can surely make India a SUPER POWER. The money will directly reach the Defence Ministry for the Army's benefit and war casualties. Come together, show solidarity with our DEFENCE FORCES, PARA MILITARY FORCES and CRPF. JOIN THE MISSION TO MAKE INDIA A SUPER POWER ! BRANCH : SOUTH EXTENSION, NEW DELHI. Please circulate as much as you can." TRUTH - Yes, you can help India's war heroes! Keeping all above aspects of statements issued by Indian Army and Syndicate Bank, we can conclude the account titled “Army Welfare Fund Battle Casualties” has been opened at Syndicate Bank, South Block Branch, New Delhi (IFSC Code: SYNB0009055), with account number 90552010165915, which has been approved by the Integrated HQ of Ministry of Defence (Army). The donations received in the fund will be utilized to pay financial assistance/grant to widows of our Battle Casualties, their next of kin and dependents. This video was published in 2009 ! showing the horrors of what and the sadness it can bring. Something is going on to divert people's mind ? Who is after such viral things ? Keep calm and do not indulge in immediate conclusions and harm innocent people. Martyrs are from J&K also. Viral Sach: Does this auto have 5 star services like WiFi and AC? Mangos help provide benefits, such as healthy immune function, normal blood pressure, good vision and strong bones, plus added protection from lung, mouth, colon, breast and prostate cancers.